As the tactics and technologies of law enforcement change, so do the tactics being used by criminals to evade capture. Apprehending Fleeing Suspects was written to provide law enforcement with the knowledge and tools required to safely capture suspects who attempt to flee from the police. 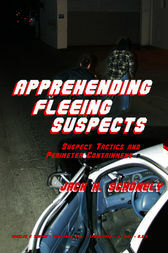 This book addresses the trends and tactics that criminals are using and examines proven techniques in how to contain, search, and capture suspects on the run. The focus is on whether to chase or contain, how to set up perimeters, management of the incident, physical conditioning, use of airborne resources, canines, communications, tactical deployment, training, and most importantly incident debriefing techniques. Following this, the criteria of the decision to contain, foot pursuit versus containment, responding officers, hiding locations, and training to meet the challenge are discussed, including the need for a team effort from start to finish. This knowledge, along with training and practice, gives the advantage to the officer, particularly during critical incidents where the capture of the suspect is paramount. The audience for this book begins with the police: training academies, managers, and local, state, and federal police departments. In addition, the book will be an excellent supplementary text in college courses on policing, policymaking, and comparative policing.